Stratos has a rich history of involvement in the automotive industry in Australia. Starting out in the mid 1970’s in Sydney's western suburbs, Stratos was named after the highly successful Lancia Stratos rally car and had a focus on seats for rally cars and off-road applications. In the early 1980's, Stratos seats became an option on the HDT 'Brock' Commodore and the 1980's saw expansion of its seat range into other markets such as coaches and office chairs. By the late 80's our focus on seats for four wheels drives and off-road applications helped Stratos land its first contract with the Australian Defence Forces. Leveraging heavily on our design capabilities, in 1995 Stratos then released a range of heavy duty forklift seats with integrated safety belt and safety options. Agreements with Toyota and Nissan forklifts helped our range of forklift seats become the premier forklift seat in use around the country. Later in that decade, Stratos helped develop seats for the marine industry providing stainless steel, water resistant seats for luxury motor yachts. In early 2000, Stratos finalised a new patented low profile suspension seat design. 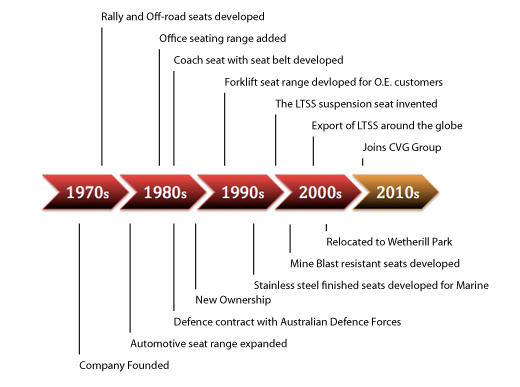 The LTSS was born and was added to our extensive range of seats. The LTSS was an instant success and soon the LTSS was being exported all around the world. It was around this time that Stratos became the supplier of mine blast resistant seats for the Bushmaster protected mobility vehicle. In 2008, having outgrown our facilities at our Smithfield factory, Stratos moved to a larger facility in a prime location at Wetherill Park, the southern hemisphere’s largest industrial estate. In July 2011, Stratos Seating Pty Ltd was acquired by the Commercial Vehicle Group, one of the largest vehicle component manufacturers in the world. This acquisition resulted in Stratos Seating no longer being a company but rather becoming just one of the many brand names encompassed within the CVG company portfolio. Throughout 2012 the Commercial Vehicle Group improved the Stratos business significantly through revenue growth, facility improvements and the accomplishment of ISO 9001:2008 accreditation. Clearly, the future of the Stratos brand is exciting! Did you know that Stratos Seating is now a part of the Commercial Vehicle Group? Visit www.cvgrp.com to find out more about CVG's impressive line of products.